"April weather; rain and sunshine both together." So true! My daffodils are in full bloom --- forming banks of yellow in garden beds. They are so cheerful and seem to be begging the sun to shine! Some days the sun wins and comes out to play, but mostly passing showers and puffy clouds blanket the skies. 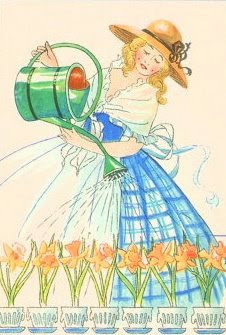 Today's task: to pick some of those daffodils and bring them in to enjoy! Loved yesterday's photo! I'm about to pick my daffodils, too. It's the only way that I will get to enjoy them. But I may wait until Saturday. Have a great evening, LaDonna! I picked some small daffodils and grape hyacinths today. I love the blue and yellow together. I hope you are enjoying your daffodils. I love daffodils! Probably my second favorite flower, love the yellow! I have tried to comment twice and it ran away! It is snowing in Colorado ....my lilacs are budding! If the other comments come through - I apologize!